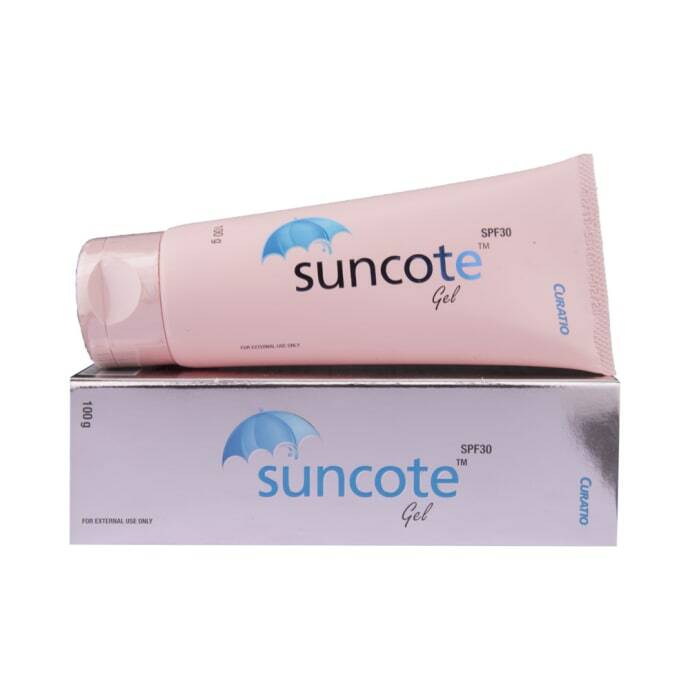 Suncote Gel is a water base sunscreen that protects the skin against UVA and UVB rays by providing a physical and chemical barrier to sunlight. Suncote Gel is a non-comedogenic which protects your skin from harmful rays. It is a gel based sunscreen that is non-comedogenic with a high SPF value of 30. Apply Suncote Gel on the exposed parts of the skin like face, neck & arms and massage. Apply the cream 15-30 minutes prior to sun exposure. Use cream every 2-3 hours after swimming. 25/13, Whites Road, 4th Floor, Mamatha Complex, Royapettah, Chennai – 600 014, India. A licensed pharmacy from your nearest location will deliver Suncote Gel. Once the pharmacy accepts your order, the details of the pharmacy will be shared with you. Acceptance of your order is based on the validity of your prescription and the availability of this medicine.